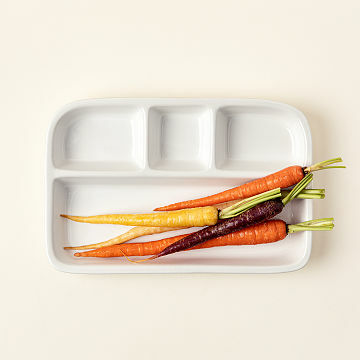 Serve up a home-cooked version of the TV dinner in this set of two stoneware trays. Dish it out and take it! Gather your whole clan on the couch for a big helping of food, a side of entertainment, and a dash of nostalgia. Switch on a sitcom and start your own laugh track with friends and family members as you serve up a home-cooked version of the TV dinner in this set of two stoneware trays coated in a food-safe glaze. Picky eaters of all ages will cheer for separated servings of meats, starches, veggies and desserts, with no need for multiple takes and extra plates. Love is a dish best served warm. Made in China. Please click here to see additional shipping information. I feel like I've already answered this. Yes I would buy this divided plate again. These are great for everyday meals. They are heavy and seem like they will last for years. Because they are stoneware they will hold up to the microwave and dishwasher. They don't nest which would have been great to save space in cabinets but they do stack well. The only thing I hated about them was each plate has its own giant manufacturer sticker right on the useable surface. Removing them was a nightmare. I soaked them in hot water, applied GooGone, and still had to scrape each plate to get the residue off. I recommend these plates if you're willing to put some sweat equity into the venture! I like the fact that you can also use it in a conventional oven. My 14-yo teenage son is SUPER picky about his food touching on the dinner plate, so as a funny Christmas present I decided that this was the perfect gift. Needless to say, he used it for the first time during Christmas dinner, and he LOVED it! He said he did not have to worry anymore about fighting with me to make sure his food was not touching on his plate. My daughter is self claimed a little bit OCD and this is the perfect gift for her! Purchased these for my kids as an upgrade from their plastic tv trays. They are sturdy, heavy (which is actually great because it alleviates the chance of them tipping over if bumped) and easy to clean. The only minor inconvenience was the label removal however I used one alcohol wipe to remove completely and it came off completely. There is a small black spot on one of the plates where the glaze did not cover but the other three were fine. One replacement would be fine. I love the fact that food is separated so that vegetable and meat liquids do not spill onto other food. I would definitely buy these again. Would make a nice gift. They fit my needs as I prepare food for my family for reheating. Very convenient.